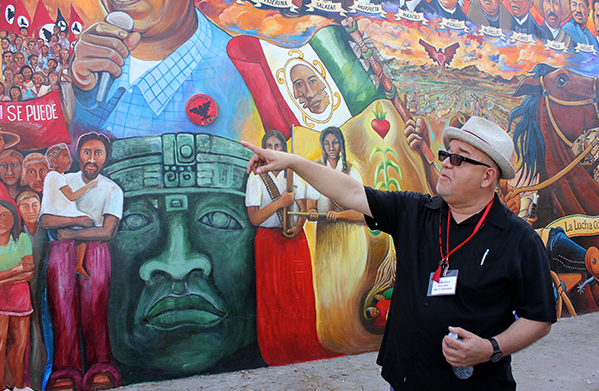 Alberto Pulido, professor and chair of the department of ethnic studies at the University of San Diego, gives a tour of Chicano Park in San Diego’s Logan Heights community during the fifth Reforma conference. The park, which is celebrating its 45-year history, is home to the country’s largest collection of outdoor murals. 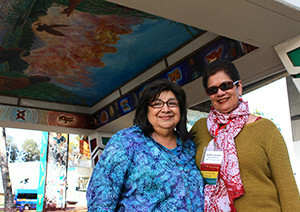 Hundreds of participants attended the fifth national conference of Reforma—the national association to promote library and information services to Latinos and the Spanish speaking—in San Diego, California, April 1–4. The theme, “Bibliotecas sin fronteras: creando nuestro futuro” (Libraries without Borders: Creating Our Future), provided the opportunity for sessions, posters, and activities that focused on diversity, community, and the future of libraries. Luis J. Rodriguez, poet laureate of Los Angeles, kicked off his opening keynote with an inspiring presentation on the importance of libraries for underrepresented populations. He tied his personal struggles as a youth to his motivation for building cultural values in his community, leading to the founding of Tia Chucha Press, a renowned small crosscultural press. In an energizing call to action, Rodriguez asked all participants to recognize and commemorate our histories and fight the oppression of cultures. Conference sessions spanned an array of topics, including immigration reform, information literacy, and technology. 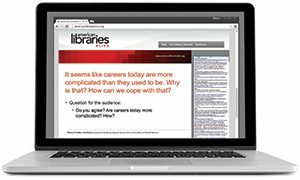 One session, “Increasing Our Relevance: Three Ways of Targeting Academic Library Services to Traditional and Nontraditional Library Users,” shared practical approaches for reproducing innovative programs used to engage academic library users. 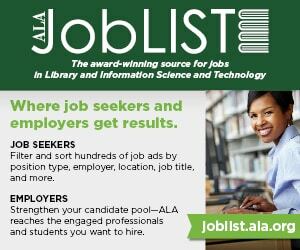 Jamie Hazlitt, outreach and communications librarian at Loyola Marymount University in Los Angeles, discussed the launch of a series of basic computer workshops at the library that are geared toward custodial staff. 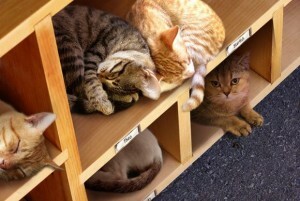 The series, taught in Spanish, provides high-demand computer literacy skills, many of which are “needed to perform required staff duties,” she said. Lettycia Terrones, reference librarian at California State University, Fullerton, described the Día de los niños/Día de los libros event, which has brought together campus families and showcased student-led literacy workshops, a bilingual puppet show, and craft activities, building collaborative bridges between campus and community partners. Romelia Salinas, instruction and reference librarian, and Teresa Omidsalar, education librarian, both from California State University, Los Angeles, detailed the Peer-Assisted Information Research (PAIR) program, which rigorously trains library mentors to help other students with their research. At the “Creating Our Future” poster sessions, library students, faculty, and staff members presented on diverse topics, including community building. For instance, a highly visited poster titled “Jalisco’s Public Libraries as a Community’s Agent of Change” discussed using alternative strategies—such creating images and sculptures—as a means to connect the community through the library and help catalyze social change in a high-poverty and low-literacy population in Mexico. One of the library’s workshops taught residents how to make pottery that was local to their community, providing them with practical skills and actively engaging them in the region’s cultural history. If sessions and posters were the heart of the conference, then events were the soul. Lively and engaging, with hugs, tears, laughter, and even dancing, these activities left participants with a renewed sense of community. On April 2 and 3, attendees enjoyed luncheons with Mexican-American writer Victor Villaseñor and Cuban-American writer Meg Medina. During the conference, more than 30 exhibitors provided print and digital resources, institutional opportunities, and arts and crafts. Many of these exhibitors also donated materials for a conference-wide raffle. In the evenings, various social activities offered opportunities to network and connect with others. Noche de Cuentos, on April 3, was a popular night of storytelling at the San Diego Public Library, which also raised money for the LIBROS chapter scholarship fund. A dessert reception, new member social, and Chicano Park tour brought librarians together to engage, network, build community, and dance. In the closing session, a panel of cross-generational professionals discussed key trends and issues resonating over the course of the conference. The theme was clear: What will we take forward as individuals and as an association? MIGUEL RUIZ is e-learning resident librarian in the Teaching and Learning Programs office at the University of Wisconsin–Madison Libraries.